Rao Group of Companies provided all services under one roof, from IELTS preparation, to consultation, to visa preparation & documentation. Rao Overseas gave us a fabulous experience & ease at each & every stage. I am glad to have obtained my visa with the help of Rao Overseas Consultancy & thank them from the bottom of my heart. Services given by Rao Overseas Consultancy are very good. Guidance given by the counselors is very useful. The staff is very co-operative & prompt to help. The way Rao Overseas works is commendable. Toughest job is done with the easiest way. I thank Rao Overseas for all their services, support & co-operation. “Rao is providing sufficient help and ease at each and every stage. Before I decided to choose Rao, I was interested in it. Rao Group of Companies gives all service under one roof, starting from IELTS preparation to consultation, to visa and documentation. After my conversation with my counselor, Ms. Abhilasha, I was impressed by nice environment, good facilities, convenient location, appealing studying atmosphere, polite interactions of all staff members and many more things.She is very polite, supportive and friendly.She gives all the guidance related to my study and my career prospects. She is my mentor. All the staff members are very cooperative and helpful from the very first day. Now being a student in Rao I am proud of saying that I am very happy with my study here and I enjoy a lot at Rao. The student counselor Ms. Ashwini Patel was there for me when I was a new student and gave me a good introduction. The other reason why I like Rao is related to the lecturers.All of them are really helpful people who enjoy teaching and being challenged by their students and their fresh ideas. The teachers do not only give you theoretical things but also combine and share practical matters about how it works in the real world. I never feel bored when I attend classes. I am able to gain more inspirations and knowledge from others, that’s a wonderful experience! Rao is providing sufficient help and ease at each and every stage. I am very happy to get Canada student visa through Rao Overseas Consultancy Pvt Ltd. All the staff members are very co-operative & helpful. I have been provided all guidance & allied services. I strongly recommend it to my friends & family. “All because of Abhilasha Ma’am and RAO”.I thank the entire team of RAO for their support and encouragement. Taking the decision to pursue an undergraduate degree in a foreign land was not an easy task. Once I was firm on my decision, I needed an authentic aid in order to apply in the universities I wished. After an unsatisfying “search regime”, my mother and I climbed up the stairs to the RAO OVERSEAS main office, considering it as our last option. The journey began. From the counsellor to the coaching staff, everyone helped me achieve my goal.Abhilasha Ma’am was my counsellor. I feel fortunate to have her as my guardian. She was a source of immense support. She helped me at every step. Be it making an acceptance decision or finalizing the recommendation letter. Today, I am a proud student of the York University, Toronto, which falls under top 3 universities of Canada. It is an enriching experience.I am studying the subject I wished to and I am contented. The entire experience, the world‐class facilities and exceptionally knowledgeable professors have taken my confidence to another level. Today, I am excelling and moving ahead with great zeal. “All because of Abhilasha Ma’am and RAO”. I thank the entire team of RAO for their support and encouragement. I feel myself lucky for being referred to consult 'Rao Overseas', in order to process my student visa for Canada smoothly. Firstly, I feel myself lucky for being referred to consult 'Rao Overseas', in order to process my student visa for Canada smoothly.My first consultation meeting was held with Mr. Ronnie and I found him very thorough with the detailed knowledge of various colleges and suggested me the appropriate one as per my qualification.He is very congenial and supportive as far as explaining the entire 'file launching' process is concerned. He explained all the aspects minutely and patiently. The Staff at reception desk are always on their toes to serve better and they indeed do an excellent job. Here, I cannot forget to mention the immense support of Ashwini Madam & Jhanvi Mam when my IELTS exam is concerned. So far, my association with the consultancy is satisfactory and I am really looking forward that things fall in order and I fly to my destination by the end of April. My sincere thanks to all the members who put in their huge efforts in preparing my Visa application file. My experience with RAO Overseas consultants is very delightful. My experience with RAO Overseas consultants is very delightful. From the very beginning since I joined the consultancy and the coaching I was fully satisfied with the services provided by them. Each and every single time the doubts that I had in my mind were attended and were cleared. I personally feel that RAO Overseas is a place where you meet your dreams. Rao is like my second family who is always with me whenever I require their help... My experience here has been very good so far. My counselor is very good and co operative she suggested me good universities too and have have even received my offer letters from the same.. Rao is like my second family who is always with me whenever I require their help they are always there to answer my doubts and queries. Rao Overseas provide me great support for my future career. Hi My journey was started with ROC in 2005. They helped me with my visa file for UK as well as pick up from airport and accommodation in UK. The staff was really helpful and that is the main reason I will still with ROC and once again they are helping me for my student visa application for NZ. They dealt with my concern professionally. I sincerely thank ROC who provided me great support for my future career. I would suggest Rao Overseas for student visa process First of all I would like to thank all the team members of the Rao for there support and right guidance in the student visa process in USA. The members are really knowledgeable and they guided me in short listing University according to my choice of courses and even toefl coaching is nice. I would suggest Rao for student visa process. My counselor is very supportive and co-operative always there to help me solve my doubts and give me an honest answer. I have experienced Rao overseas key aim is to provide the best education opportunities in abroad to students. "My special thanks to Rao overseas ! Here I feel it’s my privilege to convey my gratitude for supporting me with all the documentation, application and visa process. The support extended by the team is truly commendable and I really feel that I chose the right agent and institute for my bright future".I have experienced Rao overseas key aim is to provide the best education opportunities abroad to students. Admissions Overseas led by a high-quality group of seasoned professionals who possess in depth expertise in overseas education counseling.The staff and people at Rao overseas are simply the most motivating, engaged, focused, helpful and worthwhile. I would unhesitatingly recommend their services to anyone for best foreign education counselling. I thanks to RAO Overseas for providing me all the facilities under one roof. I, Mayank Patel has done my coaching for IELTS at RAO Overseas. Before starting my coaching I, went to the office for getting the information about IELTS, which they explained very nicely. After that they show me the facilities they provide like qualified faculties, nice classrooms and importantly library. It was very good experience to study there, because the system over there was very systematic. They gave us the option to choose the batch timing of our convenience, every between 12-5 p.m. there was practice session which was very helpful and also they have collection for reading and listening which we can practice in library in free time.The important thing that I like was there weekly test, based on which we can do analysis of our performance. I got 6.5 bands in my IELTS exam which was conducted on 15th may 2014,at Ahmedabad. So, overall it was nice experience to study there.I am also doing my consultancy at RAO Overseas consultancy. My counselor is Mr. Ronnie Thomas, he is very humble and supportive guy. Who never gets tired of solving my problem even if I ask him in telephone. I am applying for master’s in Canada for which he helps me to find out the universities , keeping proper record of my all documents in proper manner which is very helpful. So, my experience for consultancy is also very good. At last I thanks RAO Overseas for providing me all such facilities under one roof. My recommendation for those people who see their career out of India must consult Rao Overseas. I am glad that i have a chance to write something about Rao overseas that recently completed their 25 years serving those students who wants to continue their studies in abroad. 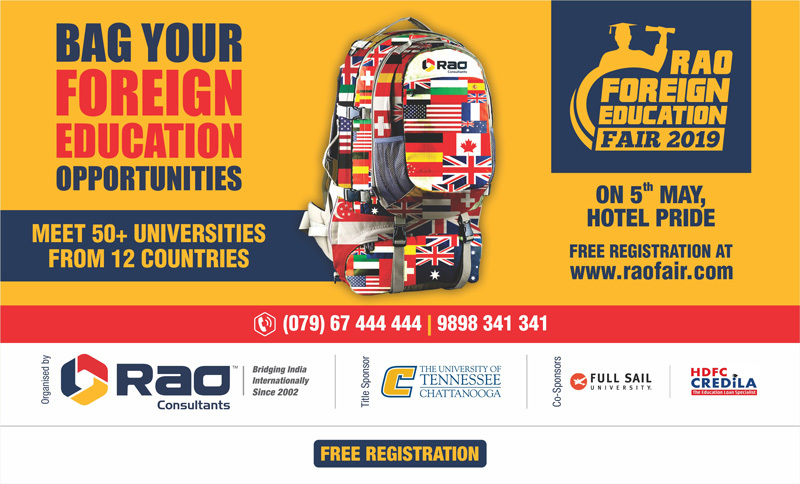 I am very grateful to the team of Rao overseas who is helping me at every step of selecting course, appropriate college, admission process, interview, file preparation and further coordination for airport pick up and accommodation & forex. My recommendation for those people who see their career out of India must consult rao overseas before they go anywhere else. I got full support from all the members of Rao Overseas. All the members of Rao consultancy are helpful and polite...They are providing right path for further studies in aboard .I want to tell about Khushbu Patel. She is fully cooperative, curious, hard-working and sincere. Always provide the proper link and immediately reply by telephonic or through e-mail. They are providing full facility for courier, and they had a strong bond up with the universities of foreign countries and also they provide coaching for the ilets and tofel. I got full support from all the members of Rao. Rao Overseas is really helpful all through the process of immigration. My experience was good because I availed all the information before even joining unlike other consultancy agencies that do not provide with any information without registration. My counsellor was very co-operative. She made efforts to prepare my documents. She was available at all times for solving queries. Rao as an organization was really helpful all through the process of immigration. They guided me with good advice and suggestions on visa application and documentation. I am Zinnia H. Bharucha pursuing M.Sc. in Mental Health in King’s College London (University of London) UK. Recent (2014 -15) statistics show King’s as the 3rd best university in the world.The journey was not easy but the Rao staff stood by me always during that phase.It made me realise that getting a good consultant and organisation is as important as getting admission in a good university. Hence, I chose Rao for the entire process from application to procuring visa.Applying for RSC and ROC together helped me overall as I saved a year by receiving admission in the major intake. Most universities don’t need the IELTS score to offer conditional admission. Thus, applying and receiving admission beforehand saved the risk of spring intake application as it was a minor one. I am extremely happy and satisfied with my result (7.5 bands).This would not have been possible without the support and guidance of the entire team of RSC and ROC. Their entire staff comprises of experienced, passionate people who never fail to help you achieve your goals. It was a good experience with Rao overseas Consultancy. It was a good experience with Rao overseas Consultancy. I got help from admission to visa and even my travel to United States. I really liked help by each and every staff member. The experience has been very good. The staff has been co operative. The whole student visa process was planned very well The experience has been very good. The staff has been co operative. The whole student visa process was planned very well. Everything was handled with care and punctuality I am glad by seeing such cooperative staff and counselor Everything was handled with care and punctuality I am glad by seeing such cooperative staff and counselor. Had an amazing experience with each and every department (Counseling Coaching and visa department) Everything went very smooth. Had an amazing experience with each and every department (Counseling Coaching and visa department) Everything went very smooth. Especially in coaching GRE professor Kiran Sir;s support was very good as I had to do Quarts after 10 years of gap. Ms. Khusboo's support at 1st floor will be remembered especially the finest she takes follow-up and does the applicaion. It has been amazing experience while my whole visa process. I am satisfied with the services. It has been amazing experience while my whole visa process. I am satisfied with the services. Thank you. Overall it was very good opportunity, Staff is very very co-operative during every level of visa application process. Overall it was very good opportunity, Staff is very very co-operative during every level of visa application process. All the staff members are helpful and co-operative. It was a great journey with Rao Overseas. I got my admission and Visa in just 6 months. It was all possible because of Rao Overseas hard work. All the staff members are helpful and co-operative. We would like to thank Rao Overseas for being supportive to us along with providing the best services. We would like to thank Rao Overseas for being supportive to us along with providing the best services. I would like to thank Rao Overseas for helping me through complete process. I would like to thank Rao Overseas for helping me through complete process. I am thankful to all the counsellors for being there at each and every moment whenever I needed help & encouraging me and advised me not as a consultant but as a mentor. I am also thankful counsellors from the visa department for helping me in my Visa file preparation . I am completely satisfied with the staff of Rao Overseas. I am completely satisfied with the staff of Rao Overseas. The counsellors have been very helpful throughout the process and have guided me in the process, visa department who also helped me a lot in the process. I am satisfied with the services on call and also personally. I have always been given satisfied answers to all my queries. After getting rejected for two times and having low percentages along with study gap I got the Visa. I am thankful to each every member of staff of Rao Consultancy and Rao Smart coaching as well. From the beginning of my journey with Rao Overseas , I got appropriate guidance from the staff. I have visited many places before coming to Rao Overseas but didn’t found that atmosphere like what I found at Rao Overseas. For comprehensive consultancy service Rao Overseas is truly the company which provides everything. I am thankful to each every member of staff of Rao Consultancy and Rao Smart coaching as well. The staffs were very supportive and provide best service. They give good guidance. I am very happy, with the information provided by counsellor. Fully satisfied. The advisors were remarkable and gave excellent services with all courtesy and good ambiences. All the services at Rao Consultants were very quick and rapid. Completely satisfied the information provided. All services were really good. The staff was very cooperative and highly generous. Got all the guidance about immigration and visa process. The Advisors were very helpful in the overall process starting from required documents, preparation and submission of visa application. A great show of patience and positive attitude in all respect by team Rao in helping me; an aged person of 84 years. The Couselors was of great help and explained all the things very clearly and in detail. The overall services were very helpful to me getting my visa done. It’s a great feeling for me after receiving the best consultancy from Rao. I am happy with them, genuine guidelines and advice provided. All services are fine. It was a good experience, I am very happy, with the information provided by counsellors. I am very happy with service provided by all the advisors. It has been a hassle free experience for me getting my process at Rao’s. The process was swift and rewarding. Most Cooperative and great service provided by Rao. I got all the cooperation from the Rao Advisor. They were supportive and focussed. It was a very good association with Rao consultants for the Past three years; they stayed with me at every stage of my progress. Most importantly, I would be very grateful to the counselling team for rendering a quality and friendly guidance. During the process I had to go through a lot of ups-and-downs for my documentation collection; but I received continuous encouragement which is something to be highlighted. Team Rao is one of the valuable assets to the company. I thank everyone for your wonderful support. The service provided by Rao Advisors was absolutely complete and satisfactory. They showed utmost patience while dealing with my doubt and questions and were always ready to discuss all areas and reach a desired conclusion while filing the DS 160 form. Team Rao were highly experienced which I experienced in my case of visa renewal. In summary the services provided were up to my satisfaction. I have been truly satisfied by the overall consultation provided during the entire process of CANADA PR. My best wishes to Rao Consultants! It was an overall wonderful experience. The staff behaved nicely and gave good guidance and managed everything well. 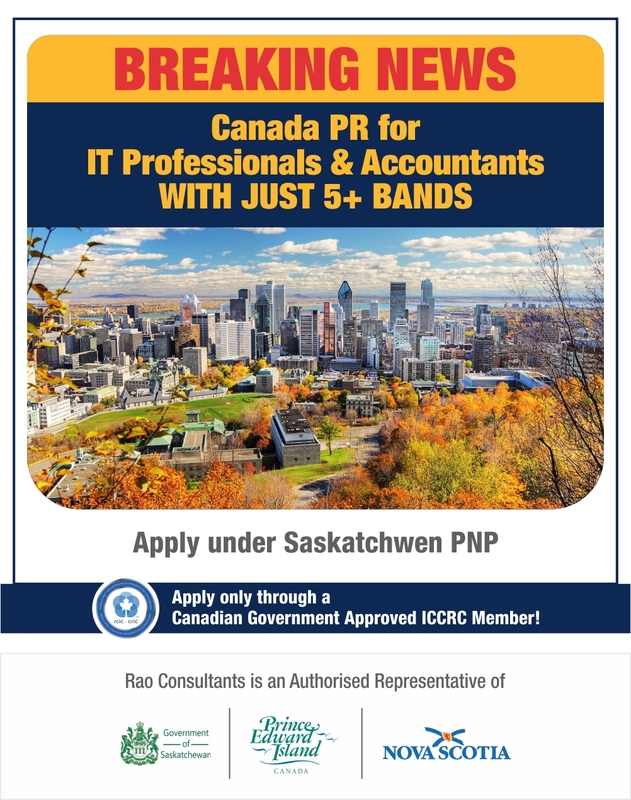 The coordination was nice and the counselor explained the Canada PR procedure clearly and was quite supportive, Truly appreciate Rao Consultants! The counselor has dealt with my file processing procedure as if she was dealing with her own file. I am very much satisfied with all the process and communication done by the counselor. After visa refusal I was worried initially, but after receiving proper attention & guidance from Rao advisor, I was assured that we were at right place and our work will be given proper justice. All the hard work of Rao and its advisor helped us to get our Canada PR Visa. Highly obliged to Rao ma’am for her cooperation for my ups and downs in the process.